'Cloudy With a Chance of Meatballs' was one of those rare non-Pixar movies that you really loved and the first news of the sequel over a year ago got me super excited and now having seen it, the excitement to spread the love for this just couldn't be contained! After saving his island from the crazy food storm created by his invention FLDSMDFR, Flint Lockwood is recruited by his childhood idol Chester V as an inventor at LiveCorp, not knowing that the machine is still very much in operation somewhere on the island and that Chester V secretly wants it to improve his own invention. When Chester V's crew's search for the machine resulted in the discovery of a dangerous cheese monster, he sends Flint back to Swallow Falls to locate the machine before the Foodimals can get off the island and wreck havoc around the world. Flint and his friends go back to the island where they find a whole plethora of Foodimals including a Tacodile, Mosquitoast, Watermelophants and Barry, a cute strawberry. Will Flint obey his idol's instructions and lead Chester to the FLDSMDFR or will he listen to his friends and try to appreciate what he has created? 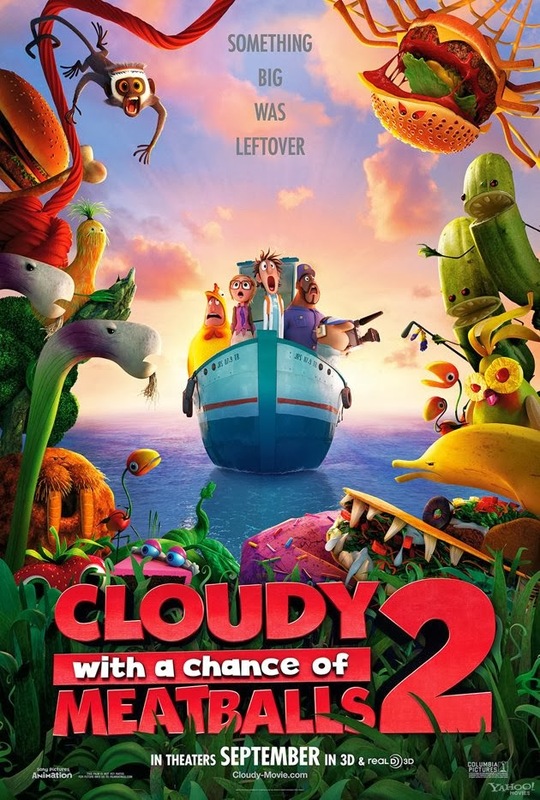 Cloudy 2 follows immediately from where we left off and gives a brief recap so anyone who missed the first will be able to enjoy the sequel. The visual style is coherent, colourful and cute and immerses you into a wacky and chaotic world of food. The beautiful world created here contributes a huge part to the success of this film, one that captivates the audience. As seen in films like 'Avatar' and more similarly 'Wreck It Ralph', you are fascinated by the visuals and want to be part of this luscious fantasy world. Whilst the plot itself is more predictable than the last and follows a rather typical "idol is villain who deceits naive protagonist who turns back on friends" and so on story line. Flint's persona and struggles was pretty much identical to the first film- hasn't he learnt anything through everything that happened?! It was nonetheless enjoyable and the lack in complexity in the plot is made up for in humour, visuals and creativity. The script was well written though slightly cheesy at times and I felt slightly dumbed down from the first. There are times where the jokes were obviously geared towards children but mostly they are so subtle that only adults were laughing during my screening. Bar the beginning 10-15 minutes, the film just kept throwing laughs at you throughout, right till the very end. 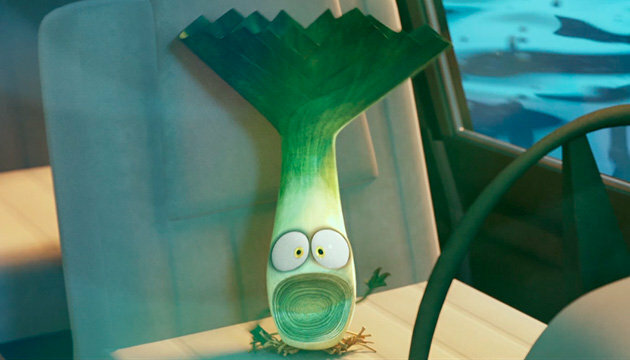 The simple 'There's a LEEK in the boat!!' play on words made the whole screening laugh. I particularly liked the reference to Jurassic Park as a large Food-monster was approaching the group and Brent's belly rippled. I also loved the fact that it references itself and brings back motifs from the first movie- the Ratbirds, the shoe spray, the walking television and gummy bears! What's new about this sequel is the extra dose of cute which comes in the form of Barry, the strawberry that pooped jam; the soft and cuddly marshmallows; as well as the slightly aggressive pickles with huge personality. Unfortunately, the sequel lacked tension and did not at any point leave you at the edge of your seat. It had a very gentle climax but the ending was sweet, left open enough for a third movie, should they choose to evolve the world of Cloudy even further. Topping the weekend box office in the US on opening weekend, it certainly is financially viable! I saw this movie in 2D but could see how the colourful graphics, the Foodimal chase and the exploding 'Party-in-a-box' invention could be enhanced by the technology! I would go see this again in 3D but it was stunning and visually immersive even in 2D. 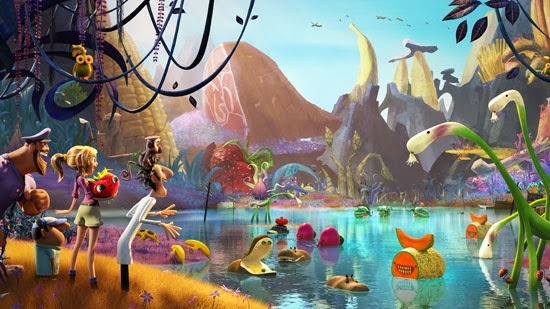 'Cloudy With a Chance of Meatballs 2' is a visually attractive movie which brings back everything you loved about the first film: the subtle humour, the clever play of food and characters with heart. Whilst the sequel lacked complexity in plot and a real nailbiter ending, it introduces a huge dose of cute which certainly made up for it. The movie is out on October 25th in the UK.